Men in their underwear kept popping up — in a Coke ad, a man sleepwalks in the wilderness, clad in boxer shorts and a T-shirt. His odyssey ends only after he finds a cold bottle of Coke. An ad for Dockers was keyed to the mantra “I wear no pants!” and featured men in their underwear romping around aimlessly. A funny ad for Career Builder.com, depicting the notion of Casual Friday run amok, showed men and women, most of them anything but physically fit, spending a day at the office in their undies. Men and their traditional roles were also mocked, but somehow also celebrated, in adsintroducing Dove for Men, a line of toiletries. A man raced through a recitation of the chores and good deeds he had obediently done to the tune of Rossini’s “William Tell Overture,” once the theme of “The Lone Ranger” on radio and TV. An ad for Dodge Charger called the muscle car “Man’s Last Stand” after depicting a supposedly put-upon male who listed all the nice things he did for his female mate. Were these ads for a post-feminist age? They seemed to have a retro appeal — for better and worse. Probably worse. 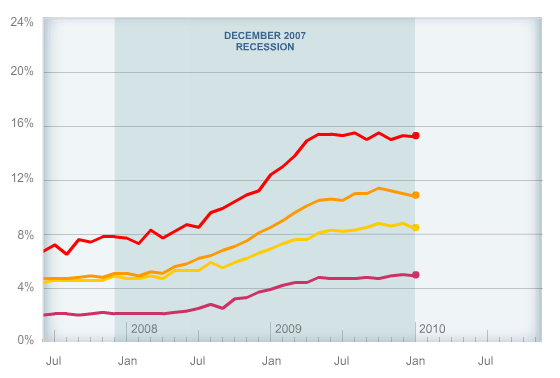 The top red line is unemployment among workers with less than high school education; dark yellow is male unemployment; light yellow is female unemployment; and purple unemployment for those with college educations or more. Even progress will likely stabilize employment patterns more along these lines than previous patterns – the industries recovering first (service, health care) are traditionally and disproportionately female, whereas the industries hardest hit (construction, manufacturing) are traditionally and disproportionately male. Contra a lot of doomsaying, manufacturing is fine in the US – we just make more stuff with many fewer jobs than we used to, and so even with huge manufacturing growth we’ll have a yet more robust sector with fewer jobs than before (see, e.g., Chris Anderson’s recent piece on distributed manufacturing). Construction has been hit hard by the inflation and then rapid popping of the housing bubble, and we shouldn’t want those particular jobs to return. But there’s plenty of stuff to build: repairing and improving our electric grid and crumbling bridges, sewers and other basic infrastructure. And then there’s “green jobs,” new energy generation, etc. So yes, there’s “something out there” that advertising firms (who are not dumb) are picking up on, a reworking of previous patterns of gender roles in our new economy. Backlash always comes first. And a lot of people talk about how to “fix” the problem of boys/men being left behind. But that presumes that it is a problem, an assumption which takes the patriarchal status quo ante as some combination of natural, just and correct. I’m not arguing that a society where increasing numbers of men are un- or under- educated and employed is a good or desirable thing: it’s pretty clear that over the long term that leads to undesirable outcomes including but not limited to violence and reactionary political movements (the above set of trends is most definitely one of the things fueling the Tea Parties). But more women in greater positions of economic and political power in this country would be a good thing – and given the macroeconomic trends, it seems likely to be part of our future.